It’s not hard to pinpoint the trends and issues that will impact the plastics industry in 2019–in many cases, they will be the same challenges that the industry has faced for the past two decades. While plastics usage in durable goods isn’t so much a focus of those wanting to rid the world of plastic waste, packaging and water bottles will be under increased pressure thanks to a harsher light being thrown on plastics in the marine environment. There’s also more noise about how recycling isn’t working, evidenced by low recycling rates and a lack of infrastructure, particularly in developing countries in the Asia-Pacific region, where most of the plastic waste is entering the Pacific Ocean. According to figures from various sources, 40% of all plastic ends up as packaging for thousands of consumer goods, which is typically used once and discarded. The many benefits of plastic makes it ideal for safety, freshness, a longer shelf-life, lightweighting for transportation and fuel savings, and even creating better health for populations around the world. 100% of the U.S. manufacturing sites operated by ACC’s Plastics Division members will participate in Operation Clean Sweep-Blue (designed to minimize pellet, flake and powder loss) by 2020, with all of those manufacturing sites in North America involved by 2022. While all of that sounds promising for creating the circular economy that everyone wants as a solution to plastic waste, how do we get these discarded, single-use items—particularly water bottles—into a value stream that captures the benefits and value of plastic waste and creates greater usefulness? While bottled water is in for consumers, plastic water bottles are out, according to numerous news reports that say consumers are becoming more concerned about the plethora of water bottles floating around in the ocean. Bottled water companies, which are enjoying a boom as consumers turn away from sugary drinks and avoid drinking tap water, are trying to come up with a better bottle. But that doesn’t look promising, according to a recent article in the Wall Street Journal, “Bottled Water Confronts Its Plastic,” by Saabira Chaudhuri (Dec. 13, 2018). U.S. bottled water consumption rose by 284% between 1994 and 2017. Most of that growth was driven by single-serve bottles, which make up 67% of U.S. sales, but recycling rates of those bottles are down, said the WSJ article. Some people are turning to reusable bottles—either metal or glass—but they have their downsides, as well. A recent study published by Fact.MR, “Reusable Water Bottles Market,” projected that this market will see a 3.1% year-on-year increase over 2017, exceeding US $8.3 billion by the end of this year. “The study remains bullish on the continual rise in demand for reusable water bottles, as growing environmental concerns are driving consumers as well as end-use industrial sectors to switch to eco-friendly alternatives for single-use water bottles,” said Fact.MR. With recycling rates for PET water bottles at around one-third of all bottles made, that leaves a lot of PET out there needing to be recycled into something—carpets and other textiles, but rarely back into food-grade PET for more water bottles. 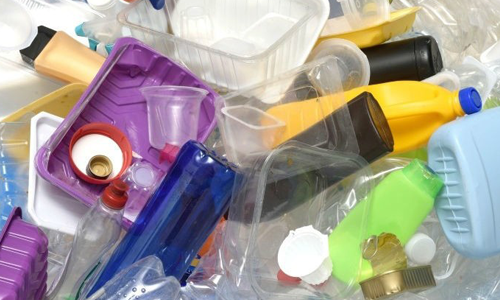 In fact, a joint report from the Association of Plastic Recyclers (APR) and the American Chemistry Council shows that plastic bottle recycling declined slightly in 2017, slipping 3.6% to 2.8 billion pounds. The overall recycling rate for plastic bottles for the year was 29.3%, down from 29.7% in 2016.